Up, up and away! 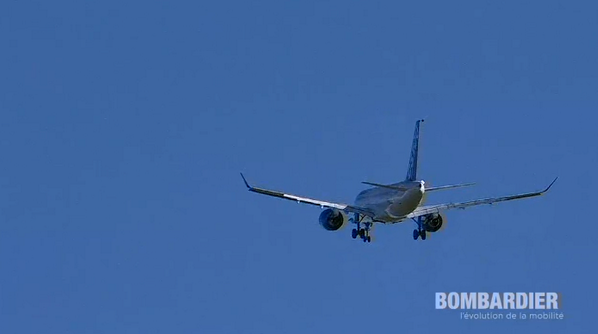 CSeries is Airborne! CS100 FTV1 silently touched down at 1623 GMT successfully completing the two and a half hour maiden flight. During the sortie FTV1 reached a height of 12,000 ft and a maximum airspeed of 230 knots. The flight crew undertook testing including flap and landing gear retractions and extensions, simulated landings, and general validation of the flight control system. “It flew very well. Performance was very impressive, we couldn’t have wished for a better maiden flight. FTV1′s state-of-the-art flightdeck was responsive and comfortable, and the aircraft handled exactly as expected. Overall, we had a very productive first flight and an excellent start to the flight test program.” Bombardier Chief Test Pilot, Captain Chuck Ellis. Five flight test vehicles will be involved in the CS100 certification campaign, with each new aircraft entering at approximately four to six week intervals. FTV1 will test aerodynamics, aeroelasticity and flight dynamics; FTV2 and 3 will be used for advanced avionics and systems testing; FTV4 will undertake performance testing; finally, FTV5 will be the first CS100 fitted with a full passenger cabin. Bombardier’s first #CSeries CS100 registered C-FBCS is airborne! With the specially modified Global 5000 chase plane following closely behind. FTV1 rotated off Runway 06 at Montreal’s Mirabel Airport at 09:55 local time on its maiden sortie. At the controls of FTV1 are Bombardier Chief Test Pilot Chuck Ellis, First Officer Andy Litavniks and supported by flight engineer Andreas Hartono. The first flight is expected to last one to three hours depending on airport weather at Mirabel, flying conditions and aircraft performance. Five years in the making, Bombardier’s CSeries represents a tremendous technological step change for the manufacturer. The first narrowbody aircraft in the market to incorporate an aluminium-lithium fuselage, the CSeries is the first fully fly-by-wire aircraft Bombardier has produced, and it is also the first Bombardier aircraft since the Canadair Challenger 600 to feature a new fuselage cross-section and new wing, an all-composite wing – another narrowbody sector first. Powered by barely audible Pratt & Whitney PW1000G engines, FTV1’s first flight also begins the age of the geared turbofan – a new era of exceptionally efficient and quiet engines. Never before has Bombardier truly attempted to directly challenge Boeing and Airbus’ narrowbody market duopoly in the 100 – 149 seat category. During the year long flight test campaign that will eventually include five test aircraft, Bombardier must prove it can meet its promised 15-20% fuel burn efficiency targets over the CS100’s 3,000nm range to a skeptical airline customer base already disappointed by programme delays. The CSeries development turmoils are no different to those experienced by other recent next-generation aircraft programmes, and Bombardier believes it will be able to attract 300 new firm orders on top of the 177 it currently holds by CS100’s EIS. Today’s first flight is a beautiful sight that’s been a long time coming.